Slightly bigger and more refined, the new Kia Sorento has arrived in local showrooms. So too has its dearer list price: the entry-spec Sorento Si now begins at $40,990 – a $2000 increase over the outgoing model. On test here is the popular mid-range Sorento SLi, complete with frugal turbo-diesel engine and on-demand all-wheel drive. The full-size family-friendly SUV arrives as standard with seven seats and a six-speed automatic transmission, and is priced from $49,490 (plus on-road costs). When a manufacturer says its new model is more refined, it’s either marketing spin or an admission the old one wasn’t – or sometimes both. Now I woudn’t say the previous Sorento was unrefined; in fact, it was a really good thing. But the latest Sorento is just so much better that simply saying it’s “more refined” is an understatement of the highest order. Utilising Hyundai-Kia’s ‘N’ platform – which it shares with the new Carnival – the Sorento brings evolutionary styling changes and minor revisions to the driveline of the UM-series range. Taken at face value you’d be forgiven for thinking the changes aren’t worthwhile. But drive the car and you’ll find a revolutionary improvement in dynamism, ride comfort, road holding and NVH (noise, vibration and harshness). 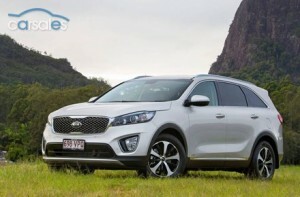 Kia has done well to insulate the cabin from unwanted mechanical noise, and suppressed road, wind and tyre noise to the point that the Sorento now rivals the hushed interiors of many comparably-sized prestige SUVs. The body and wheelbase are longer than before (+90mm and +80mm), which appears to have improved stability, as well as benefitting passenger and cargo space. The second-row seats are now generously proportioned, while the third-row rivals the Pathfinder for space (growing +15mm). There’s also an increase in cargo capacity, the room behind the third row growing to 320 litres. But it’s the Australian-tuned chassis that is probably the most noticeable gain. Take away the glitz of the tech-heavy cockpit, comfortable pews and stylish body and it’s the feeling of the altered suspension geometry that gives the Sorento a noticeable edge. Compared to the current-gen Santa Fe (on which the previous Sorento was based), it’s evident the Sorento has a more supple ride, while feeling very nearly as eager in hard cornering. There’s plenty of feedback to the driver, too; though the contrast of the steering wheel’s hard plastic between 10 o’clock and 2 o’clock feels awkward as it slips and grips past the softer-touch leather. Rougher dirt roads and poorly maintained C roads also prove a pleasure in the Sorento. You tend to flinch on approach to larger potholes in SUVs spec’d with largish alloy wheels, but the Sorento SLi (on 18-inch alloys) – and for a couple of days the Sorento Platinum (on 19-inchers) – felt unfussed on such roads, taking even larger craters in their stride. I think Ken Gratton was right when he said the Sorento offered a “convincing” ride/handling blend in his launch review. The Sorento, like many in its class, features a MacPherson strut (front) / multi-link (rear) suspension arrangement, is stopped by four-wheel disc brakes, and directed by electric steering. All are well tuned for family use, the progressive brake pedal comfortably achieving soft stops (and holding them thanks to an Auto Hold function) and the multi-mode electric steering feeling dampened to the level you might expect from a high-priced German. Less Germanic, and indeed less American, is the Sorento’s R-Series turbo-diesel engine. With a 2.2-litre displacement the four-cylinder unit makes a competitive 147kW and 441Nm, though it’s not as gutsy as some of its competitors, like the (much dearer) new Audi Q7 (with 200kW and 600Nm) or the Jeep Grand Cherokee (184kW and 570Nm). Performance is best described as progressive or linear, yet still perfectly adequate for our draconian speed limits. The other upshot is that efficiency scores quite highly, a mix of city and freeway driving returning an average of 7.6L/100km. The Sorento’s cabin is very presentable and appears to feature higher-grade materials than was previously the case. The use of monotone hard plastics is now less evident, broken by carefully crafted geometric lines and trim garnishes. The layout of secondary switchgear is logical and the infotainment and ancillary systems easy to use. Though I did find the lack of turn-by-turn instructions in the instrument panel a little disappointing considering how lavish it otherwise looks. Both grades of Sorento sampled felt generously equipped for the money, the SLi being particularly good value. Dual-zone climate control, a decent audio system, seamless Bluetooth connectivity and cruise control are all very welcome, though I reckon electric seat adjustment could have squeezed in for the price. Vents to all three rows are also a nice touch, as is third-row windows little kids could actually see out of (take note, Hyundai). On the downside, the second-row seats don’t fully tumble forward, which makes entry and exit to the third row tricky for adults. Fortunately the Sorento’s third row can be access via both the passenger’s and driver’s sides, which makes things a little safer when getting the littlies in from a kerb-side park (take note, Nissan). Of course the Sorento also offers the expected number of cup and bottle holders, plenty of knick-knack storage, and a good number of USB ports and 12-volt outlets. It’s also good to find a matching alloy spare wheel up back, stowed under the floor so you don’t have to empty the boot in case of a flat. As a quiet-riding seven-seater with families front of mind – and with one of the most comprehensive after-sales packages in the business – the Sorento makes a lot of sense. It’s a practical, economical and capable SUV with enough bling to satisfy even the most discerning family buyer. If you haven’t considered a Kia before, you’d be silly not to now.